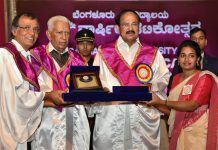 New Delhi: The Vice President of India, Shri M. Venkaiah Naidu has said that scientific institutions to nurture talent and foster path-breaking innovations to transform the socio-economic landscape of the country. He was addressing the gathering after inaugurating the Platinum Jubilee Celebrations of CSIR-IICT (Indian Institute of Chemical Technology, in Hyderabad today. The Union Minister for Science & Technology, Earth Sciences and Environment, Forest & Climate Change, Dr. Harsh Vardhan, the Governor of Telangana, Shri E.S.L. Narasimhan, the Deputy Chief Ministers of Telangana, Shri Kadiyam Srihari and Shri Mohammad Mahmood Ali and other dignitaries were present on the occasion. “It is indeed a momentous occasion for CSIR IICT which is entering its platinum jubilee year today after completing 74 years of service. I would like to congratulate its past and present leadership, staff and students for contributing to our country’s development over this period. I am sure, the institute will continue this quest for excellence with greater vigour in the years ahead. Science is the key lever for sustainable development. A country’s prosperity and security are directly dependent on its scientific and technological progress. Scientific innovations from penicillin to space technologies have changed the world forever. Modern drugs, internet, e-commerce, digital learning, innovations in agriculture, bio-technology, construction and infrastructure are some of the innovations that have had a profound transformative impact on our lives. These innovations have by and large been led by the private sector However, Government has a great responsibility. 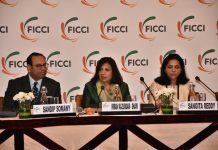 It has to create regulatory frameworks, create conducive conditions for nurturing research and innovations. CSIR, with its network of 38 state of the art laboratories specializing in chemistry, biology, engineering, oceanography and materials, has been contributing immensely to Government of India’s ambitious scientific agenda. I am glad that institutes like IICT are working in that direction. Historically, India has been a lighthouse of knowledge. Our Ayurveda system of medicine can be traced back to 5000 BC, Indus Valley Civilization had irrigation and sewerage systems as far back as 2500 BC. By 200 BC, South India was making high quality wrought iron and, of course, the invention of ‘zero’ and contributions to astronomy are well known. Let us look at some of the invaluable contributions made by our ancestors. Aryabhatta’s ‘Aryabhattiyam’ is considered a seminal work; equally pioneering work is Panchasidhhantika of Varahamihira. Of course, Charaka and Sushruta are known as Fathers of Surgery. Rishi Kanad first spoke of “anu’’ (atom) as an indestructible particle of matter in Kanada Sutra, while Patanjali is considered as Father of Yoga. There are innumerable legendary scientists of ancient India who have enriched the world’s scientific treasure. We need to take pride in their achievements and share the knowledge we have inherited from them with the entire world. India’s contribution to science in modern era is also quite significant. In early 20th century, Prof. Satyendranath Bose’s ‘BOSON’, Prof. Subramanian Chandrasekhar’s ‘Chandrasekhar limit’, Sir C.V. Raman’s ‘Raman effect’ and Prof. Jagadeesh Chandra Bose’s ‘wireless communication’ have earned global recognition. As a matter of fact, there is no dearth of talent in India. The only thing required is to create the right ecosystem for innovation to thrive. I am glad to know that CSIR is ranked 9th amongst a total of 1,207 government institutions based on a composite indicator that combines research performance, innovations outputs and societal impact as per latest Scimago rankings. However, we need to hugely step up our investments in R & D to promote the culture of innovation and discovery. Apart from government spend on research, the private sector needs to come forward to liberally support research. The right ecosystem for research and innovation needs to be created in all the scientific labs by reducing procedural bottlenecks, removing hierarchical barriers and resetting priorities. The leadership in scientific institutions should encourage bright young scientists to come up with new and unconventional ideas and projects. Opportunities must be provided for undertaking path breaking research that answers one or more of current societal challenges. As you all are aware, India along with 192 nations adopted UN’s 17 sustainable development goals. These goals include ending poverty in all its forms, ending hunger and promoting sustainable agriculture, good health, equitable quality education, gender equality, sustainable management of water and sanitation for all. All these ambitious goals cannot be achieved if we adopt the “business- as – usual approach”. Scientific research and innovation can accelerate societal progress on multiple dimensions. Institutions like CSIR have a major role to play in moving the country forward and transform its socio-economic landscape. We have nearly 800 universities and several important scientific institutions spread across the country. As part of encouraging innovation and improving the quality of life of people, the Government of India has launched several initiatives. ‘Make in India’ envisages to make India a manufacturing hub for the world and generate millions of jobs. ‘Swachh Bharat Abhiyan’ intends to create a clean India of Mahatma Gandhi’s dreams and can substantially improve our health levels. Schemes like Jan Dhan Yojana, Digital India and Aadhar are aimed to make people partners in the economic development of the country. All these programmes rely on science and technology. The programmes can be enriched and the outcomes can be more sustainable if they are constantly supported by Research and Development(R&D) efforts. The spirit of enquiry and the scientific temper, the spirit of asking relevant questions and seeking practical answers must become an integral part of our school and college education systems. India is a young nation today with about 65 per cent of the population below the age of 35 years. We need to fully tap the potential of this huge human capital. We have to equip the young people with scientific and technological knowledge and skills. The quality of teaching and research in our Universities and scientific institutions must be considerably improved. Government of India is promoting entrepreneurial spirit among its citizens through Start Up India initiative. This scheme provides great opportunity for technology graduates to start new companies. CSIR should take measures to ensure that Ph.D. scholars are properly trained and guided to make use of these opportunities and turn into entrepreneurs. I am glad that many laboratories of this organization are already hosting incubation centres and are promoting this activity. Though we are progressing on various fronts, incremental improvements are not enough. We need to nurture our existing talent and foster creative disruption and path breaking innovations. Scientists and scientific organizations have to set ambitious goals and strategically position themselves to become leading institutions in the world. The government must facilitate this quest for excellence by providing funds, freedom and flexibility. Science, in my view, has the greatest impact on people’s lives and institutions like IICT should focus on research on those areas that will impact large populations. For instance, I would like to mention agriculture and environment in which you have already made significant contribution. India is basically an agriculture economy and it cannot progress unless the farmers’ lives are improved. Scientific institutions need to supplement the efforts of the government and I am glad to note that CSIR has launched mission mode projects to improve income of farmers by cultivation of phyto-pharmaceuticals and aromatic plants. I am informed that CSIR is also planning another mission to make available new and improved crop protection chemicals. This kind of focused approach to solve sector wise problems is commendable. Global warming is affecting our lives with unusual patterns of temperature and rainfall. Pollution is adversely impacting millions of lives directly. 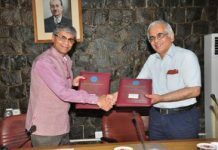 Chemical technology institutes like IICT have to take initiative in developing processes that greatly reduce pollution and mitigate global warming. I understand CSIR has already started two mission projects in this area and developing new catalysts and sustainable processes for chemical and pharmaceutical industries. I am also happy to note that CSIR is working on cleaner and eco- friendly fire crackers to reduce air pollution. I am aware that the core strength of CSIR-IICT lies in organic chemistry and it has continued to excel in this field for over seven decades. The research efforts during these years have resulted in the development of several innovative processes for a variety of products necessary for human welfare such as drugs, agrochemicals, food, organic intermediates, adhesives etc. I am pleased that today CSIR-IICT is widely acknowledged as a valued technology partner and a competent solution provider to the industry in Pharma & generics, agrochemicals & green pesticides, food & nutrition, energy & environment, polymers & functional materials, industrial catalysts & fine chemical sectors. I find it very apt, therefore, that the Institute is organizing an International Conference titled “Sustainable Chemistry for Health, Environment and Materials” (SuCHEM-2018) during 6th to 8th August to commemorate the beginning of Platinum Jubilee year. I have visited CSIR-IICT on quite a few occasions in the past and I still cherish the interactions that I had with the scientific fraternity. I strongly believe that the Institute will emerge as one of the best globally acknowledged research institute in its field. I congratulate Dr. S Chandrasekhar, the Director, Staff and Students of CSIR-IICT, on the occasion of the foundation day as well as a day when the Institute is entering its Platinum Jubilee Year. The curtain raising function on this occasion should be the beginning of a new glorious chapter in the annals of this illustrious institution. As the ancient Indian sages have said in Ishavasya Upanishad, “Let us unravel truths hidden in a golden bowl for the greater good of humanity and for illuminating our paths with righteousness.” Let the scientific truths you discover make our country and our world a better place to live in.